The legal implications: Road Traffic Act 93/96 as in effect since March 1998. 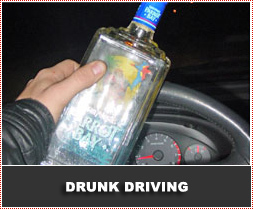 Occupy a driver's seat of a motor vehicle, the engine of which is running, while under the influence of intoxicating liquor or a drug having a narcotic effect. Occupy a driver's seat of a motor vehicle, the engine of which is running, while the concentration of alcohol in any specimen of blood taken part of his or her body is not less than 0,05 gram per 100 millilitres. 3. If, in any prosecution for a contravention of the provisions of subsection (2), it is proved that the concentration of alcohol in any specimen of blood taken from any part of the body of the person concerned was not less than 0,05 grams per 100 millilitres at any time within two hours after the alleged offence, it shall be presumed, until the contrary is proved, that such concentration was not less than 0,05 grams per 100 millilitres of blood at the time of the alleged offence. is proved that the concentration of alcohol is in any specimen of breath of the person concerned was not less than 0,24 milligrams per 1000 millilitres of breath at any time within two hours after the alleged offence, it shall be presumed, until the contrary is proved, that such concentration was not less than 0,24 grams per 1000 millilitres of breath at the time of the alleged offence. An intoxicating drug refers to any medication or substance that will have a sup-oppressive effect on the CNS including: Hypnotics, Anti-histaminicae and sedatives etc. This section makes provision for the sampling of blood without the consent of the alleged perpetrator. A law enforcement officer orders the doctor or nurse to collect the necessary samples whether it is blood or otherwise. The second part of this Section 37 allows for the use of the necessary restraints or force in order to obtain the desired specimen(s). The order is a written one and it is the well-known SAP308 (a). This form is to be completed by the Police Officer and then handed to the doctor or nurse. The form instructs the doctor to determine the sobriety of the subject. If a doctor or nurse does not receive this instruction prior to the examination, the touching of or introduction of a needle into the body of the subject will constitute the elements of at least common assault. Secondly, what are the ethical issues as far as use of restraints or the application of force is concerned? 1. From a legal perspective it is perfectly within the parameters of the law. 2. From a medical ethics perspective, a doctor shall never engage in violent acts in order to subdue a patient. 4. If the doctor refuses to obey the police order (SAP308) it may boil down to obstructing the ends of justice. What is the ethical way out for the medical practitioner? We have to participate to maintain law and order, and prevent other innocent law abiding citizens from becoming victims of the intoxicated. Without touching the body of the alleged subject an evaluation can be made. What observations can be done? It is recommended that whatever the subject does during this observation be jotted down. It is for him or his legal adviser to prove that this everyday normal behaviour. Further it is accepted by the judicial system that the observations of an experienced police officer or medical practitioner is sufficient evidence to prove intoxication. The moral of the story is, there are other ways out of this dilemma and the medical practitioner's integrity need not be jeopardised. This approach will serve the ends of justice and even fulfil the requirements of any human rights action. Of course the new Act brings a relief for the police officer, doctor etc. with the clause that no one shall refuse the sampling of blood or breath analysis. This alone will constitute a transgression of the law of equal magnitude to the original charge. The Criminal Law and Procedure Act makes further provision for doctors and nurses at hospitals to collect a blood specimen if they are of the opinion that the result may affect the outcome of a later legal procedure. Doctors and nurses are legally obliged to collect this sample and need no official consent to do it. The specimen has to be handed to a police officer and it is advised that the receiver sign a receipt. Occupy a driver's seat of a motor vehicle, the engine of which is running, while the concentration of alcohol in any specimen of blood taken from any part of his or her body is not less than 0,05 gram per 100 millilitres, or in the case of a professional driver referred to in section 32, not less than 0,02 gram per 100 millilitres. 3. If, in any prosecution for an alleged contravention of a provision of subsection(2), it is proved that the concentration of alcohol in any specimen of blood taken from any part of the body of the person concerned was not less than 0,05 grams per 100 millilitres at any time within two hours after the alleged contravention, it shall be presumed, in the absence of evidence to the contrary, that such concentration was not less than 0,05 grams per 100 millilitres of blood at the time of the alleged contravention, or in the case of a professional driver referred to in section 32, not less than 0,02 gram per 100 millilitres, it shall be presumed, it the absence of evidence to the contrary, that such concentration was not less than 0,02 gram per 100 millilitres at the time of the alleged contravention. 4. Where any prosecution in terms of this Act proof is tendered of the analysis of a Specimen of blood of any person, it shall be presumed, in the absence of evidence to the contrary, that any syringe used for obtaining such specimen and the receptacle in which such specimen was placed for despatch to the analyst, were free from any substance or contamination which could have effected the result of such analysis. Occupy a driver's seat of a motor vehicle, the engine of which is running, while the concentration of alcohol in any specimen of breath exhaled by such person is not less than 0,24 milligrams per 1000 millilitres, or in the case of a professional driver referred to in section 32, not less than 0,10 milligrams per 1000 millilitres. 6. If, in any prosecution for a contravention of the provisions of subsection (5), it is proved that the concentration of alcohol is any specimen of breath of the person concerned was not less than 0,24 milligrams per 1000 millilitres of breath at any time within two hours of the alleged contravention, it shall be presumed, in the absence of evidence to the contrary, that such concentration was not less than 0,24 milligrams per 1000 millilitres at the time of the alleged contravention, or in the case of a professional driver referred to in section 32, not less than 0,10 milligram per 1000 millilitres, it shall be presumed, in the absence of evidence to the contrary, that such concentration was not less than 0,01 milligrams per 1000 millilitres at the time of the alleged contravention. 7. For the purposes of subsection (5) the concentration of alcohol in any breath specimen shall be ascertained by using the prescribed equipment. during his or her detention consume any substance that contains alcohol of any nature, except on the instruction of or where administered by a Medical practitioner. During his or her detention smoke until the specimen referred to in sub-Section (3) or (6) has been taken, as the case may be. 9. No person shall refuse that a specimen of blood, or a specimen of breath, be taken of him or her. What are the rights of a person arrested under this Act? 3. To know what to expect during this examination. Discuss the process with him/her. 4. To have access to their personal medical practitioner. (If available) He or she will have to take responsibility for costs incurred during this process. 5. To be examined in a facility which was designed and equipped for this purpose- not in a police cell, charge office or other ill equipped location. 6. The physical well being of the person enjoys priority. No blood or breath Sampling procedure shall postpone urgent medical treatment for a life threatening condition. 7. Severely intoxicated persons have to be referred to a hospital for observation. 8. Lesser intoxicated persons, if detained should be observed every 15 minutes by an experienced police officer until sober. 9. He or she shall have access to their normal routine medication. 10. He or she has the right to be referred for rehabilitation should it be an obvious Case of alcoholism. Discuss it with the patient and make a written recommendation to this effect for the magistrate's perusal on the bottom of the SAP/54 or on a separate letter. 11. The privacy of the person is of paramount importance. To fulfil the Requirements of the chain of custody, it is important to have the police officer present during the collection of the blood sample. If the condition and behaviour of the subject permits, the physical examination should be done in privacy. If the examiner is of the opposite gender to the subject, it is advisable to have an independent person of the same gender as the subject available during the examination. In the case of unruly behaviour it is recommended that a police officer be available during the examination.